Concert hall "Concertzaal", opened 2 October 1890. In 1916, the Cavaillé-Coll organ (built 1875) is sold to the Concertgebouw at Haarlem. Theatre hall "Paleisschouwburg", opened 13 Oct 1890 with "Stanley in Afrika". Capacity: 1500 persons (1890), 1350 persone (1894), 1112 persons (1908). Used for opera, operetta, and popular theatre performances. 1883 extension by an apartment and shopping wing, "De Galerij". Small theatre hall "Kleine Zaal", opeend 3 November 1893 with Henrik Ibsen's "Rosmersholm". 1894 rebuildings by W. F. K. Roemer. 1922-1929 various rebuildings. 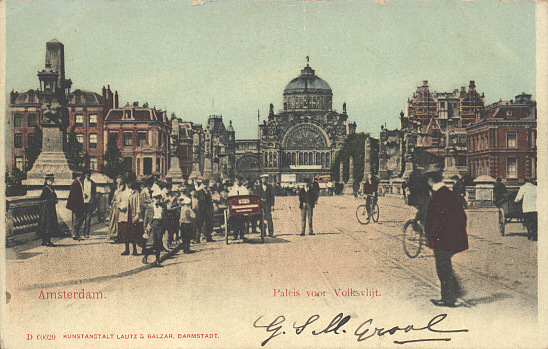 Destroyed by a fire on 18 April 1929, leaving only the shopping mall "Galerij" intact. In 1961, the "Galerij" was demolished and the national reserve bank headquarters were built on the site. Since 2002 a citizens' group around Wim T. Schippers campaigns for the demolition of the bank building and the reconstruction of the Paleis voor Volksvlijt. 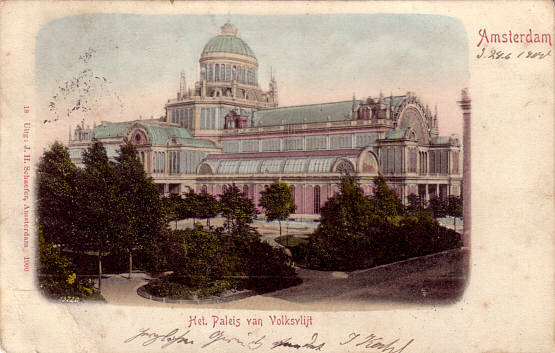 Front Text: "Amsterdam - Het Paleis van Volksvlijt"
Front Text: "Amsterdam, Het Paleis van Volksvlijt"